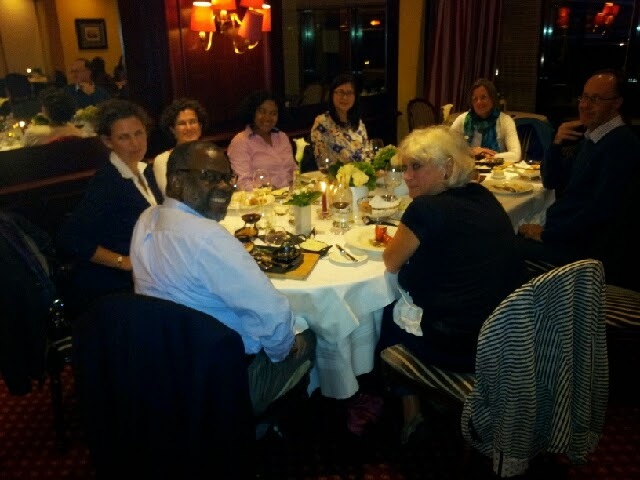 A group of Geneva-based alumni met together for dinner on September 26th. Twelve alumni met for drinks and nine had dinner together. The group consisted of former students and staff and was organised by IDS Ambassador Milasoa Chérel Robson. The reunion coincided with the visit of former IDS alumni Chair Richard Longhurst (DP81) and his wife Judy (former IDS staff). The group consisted of Ricardo Gottschalk, Samuel Gayi and Milasoa (all from UNCTAD), Sarah Cook, Director of UNRISD, Maite Irurzun (of l'Agence de Médecine Préventive and former IDS Alumni Committee member), Sally-Anne Way of OHCHR, Arianna Rossi, Azfar Khana and Edmundo Werna (the three of them from ILO) and Shin-Yuan Lai of the Permanent Mission of Taiwan. Shin-Yuan surprised the group by generously footing the bill at the restaurant. Richard briefly outlined some of the recent changes at IDS including the appointment of the new Director, Melissa Leach, and the alumni emphasised how important it is for them to be kept in touch with developments at IDS, and encouraged all IDS staff visiting Geneva to get in contact with the group. Milasoa shared with the group the intention to organise an intellectual event in cooperation with IDS in the forthcoming months. The idea was well received and gathered support from some alumnis who are keen to contribute to developing stronger links between IDS and the Geneva-based international development community.